While not his first title, most of the fans of Suda51 started with Killer7, me included. So it’s nice to see that Grasshopper hasn’t forgotten about it and it’s planning some sort of collaboration with LET IT DIE!. While nothing specific was revealed at the time of what sort of collaboration this will be, it is scheduled for Spring of 2018, so as we get closer more information should be revealed. EL SEGUNDO, Calif. – Feb. 28, 2018 – In celebration of Grasshopper Manufacture’s 20 years of artistic vision in the industry, GungHo Online Entertainment America and Grasshopper Manufacture are bringing the stylized classic killer7™ to LET IT DIE via a collab on PlayStation®4 (PS4™). 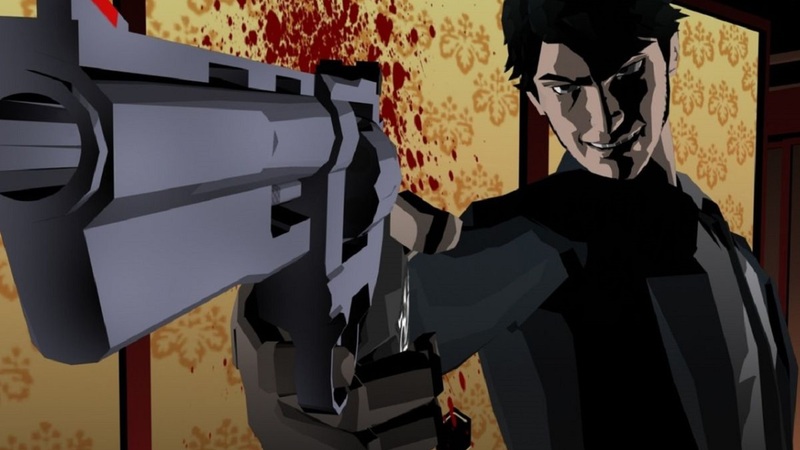 In killer7, players took on the role of Harman Smith, an assassin with control over seven different personalities. Slated for Spring 2018, players can look forward to the collab in the coming months. For future information, please visit www.letitdiethegame.com/news. LET IT DIE is available for download from the PlayStation Store. From Grasshopper Manufacture, the creative minds behind Lollipop Chainsaw and No More Heroes comes LET IT DIE! Die to survive in this free-to-play hack and slash survival action game. Set in a post-apocalyptic Japan, players start with little more than their undergarments and must forage for powerful weapons and armor to do battle with the over-the-top ultraviolent future that waits. LET IT DIE is a PlayStation®4 exclusive title available now and has been downloaded over four million times. killer7, Capcom, the Capcom logo, Ace Attorney, Devil May Cry, Mega Man, Monster Hunter and Resident Evil are either registered trademarks or trademarks of Capcom Co., Ltd., in the U.S. or other countries. Street Fighter is a registered trademark of Capcom U.S.A., Inc. “PlayStation” is a registered trademark of Sony Interactive Entertainment Inc. All other marks are the property of their respective owners.